NotBlueAtAll » Blog Archive » I think I’m ready for a revamp! What the hell am I talking about? 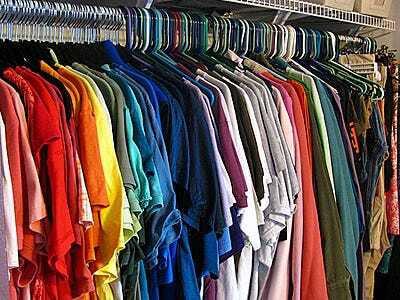 My wardrobe! I know, I started out sounding all kinds of serious and this is all just about clothes. But for me, that’s a pretty serious thing. I don’t take fashion lightly these days and I have found a sliver of self-care in the process of getting dressed in the morning. I have begun to shift my looks in new and sometimes surprising ways, for me, and I think I’d also like to maximize the small space that I live in (my bedroom) better. I basically live in a bedroom. I have a small closet in the hallway for my dresses and other “must hang” items, but now that’s nearly maxed out. In my room I have three dressers. Yes, three. *Sigh* They are made of particle board and part of a set that included my platform (with storage drawers beneath) bed frame. I know it’s time to downsize. One of the dressers looks like it aspires to be a vanity, but it’s really just a wider and shorter dresser with a big mirror in the middle. And the top drawers on that one always seem to come off the tracks. The closet in my room, while organized and maximized, is completely full. No, it’s time and I want a grown up lady’s vanity! Preferably, a lovely art deco style one, with a gorgeously comfortable chair to sit upon. I dream of the day I can get ready like a fancy lady person! Ha-ha! It’s a dream, but it would also give me more practical use of the space that I have. You see, I also use that same dresser as my entertainment center, which makes the whole thing seem mega cluttered, even when it’s not, which let’s face it, usually it is! If I did this whole revamp, at least in my head, it would mean pairing down my entire wardrobe (okay, maybe not my dresses! ), and having room for this vanity and a smallish entertainment center-like set up. I want a slightly larger television for my room as well, the one I have works fine, but I spend so much time in there, I think I might as well update everything while I can. Plus all the TV’s are on sale or will be shortly and I know I can get a great bargain! The painful part of this is letting go of items of clothing I’ve had for a long time. Not items I’m worn out completely, mind you. More of the “Oh my glob I have to have this!” variety, but then I never ended up wearing them, for whatever reason. I wonder if the issue is styling? I’ve only recently begun to experiment in this realm. It’s not easy, either, but it can be fun. I have been surprised by what the right and sometimes odd combination of accessories can do to or for an outfit. I just think my current set up is not the most efficient for my needs. I end up wearing the same few outfits because they’re more accessible and put together because they are what I wore or purchased most recently. Out with the old or unworn and in with the new or newly appreciated! Ultimately I would love to have my wardrobe set up in such a way that makes sense. Like, you know what order you put things on? I want the drawers of my dressers set up like that. But then, there’s like winter stuff? Huh…tough one! Ha-ha! No, I have a sweater drawer already. It will be the getting rid of things part that will be tough. I think what would work best for me is to have someone super supportive, who has a flair for these things already, there to coach or guide me through the process. Someone who will be firm but compassionate with me. Someone who understands that plus size clothing doesn’t fit in a drawer the way other clothing does. It’d be rad, too, if this magical fatshion fairy also wore my size so they could get some free clothes out of the deal (though I’d certainly give them gas money and buy them dinner, or would want to). They would have to be a good hugger, too! Ha-ha! Whenever things were really bad at home while growing up, it meant a major clean up of our whole house. This meant we were on the verge of eviction. This meant something happened or was about to. This meant I would have to throw away many of the few possessions I had. It always felt like I was in big trouble. It was always scary and filled with fears of the unknown. It always felt like everything was out of my control or influence. Even though I know this isn’t the case now, it always feels that way when I start the process. When my (now ex) husband would move the furniture around in our apartment, which was fairly often, I would get so upset and fight him tooth and nail over every little thing. I didn’t understand why it hurt so much at the time, though. I know that was really hard for him. I felt crazy, too. I felt like my brain was broken because I didn’t know why such a simple thing would set me off so badly. I am glad that I understand this now, but it’s still difficult. However, I do have a couple of solo victories under my belt now! There’s my big closet cleaning and organizing project I did this past summer. And more recently, I went through my entire shoe collection (Whew!) and organized them, sorted out ones to toss/donate/sell. It felt good, I felt accomplished and it felt like a breakthrough! You see, the home I grew up in was a mess. Not just a cluttered sort of mess either, though that’s sort of my style now. It was disgusting! I have seen a house kept this way and spent time in it for several hours with friends and it took every fiber of my being to not sob the entire time. Talk about triggering?!?! I don’t know why it was like that. Both sets of grandparents’ houses were clean or normal. I was never allowed to have friends over because of the filth. And when I say filth, I am speaking literally! Clean anything just didn’t exist in my childhood home. It is a source of great shame for me and it is because of this that I get caught up in heavy emotions when I clean or organize or move anything. And once I start with one thing I go on a spree of CLEAN ALL THE THINGS!!! Advice? Suggestions? Can you relate?